2010 is supposed to be the year of many things. I’ve heard it called the year of Android and more recently, the year of the ebook reader. I used to read a lot when I was a kid at the behest of my parents. My mom always tried to enforce a balance between video games and books. That unfortunately stopped as AnandTech took off. Most of my recreational reading turned into trying to understand datasheets or reading other reviews, the rest of the time was spent writing. 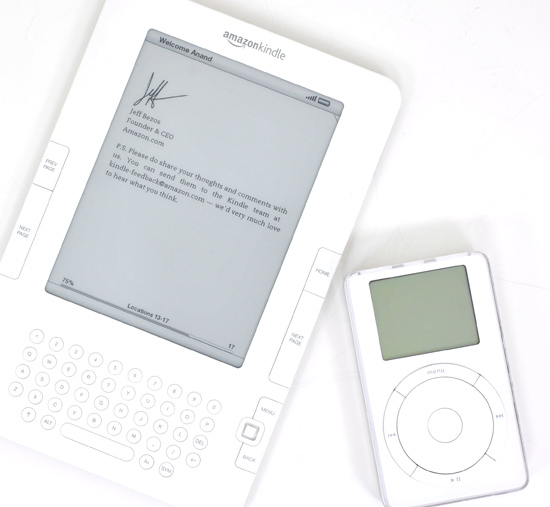 My first and only ebook reader was Amazon’s Kindle 2, and while it didn’t reinvigorate my passion for reading, it did a lot better than expected. 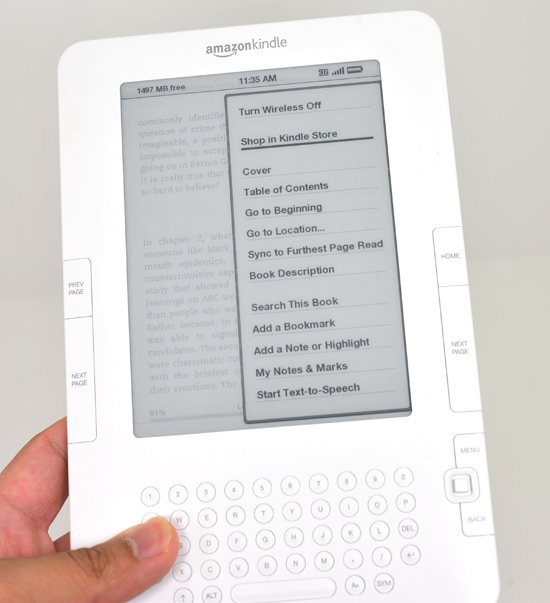 Amazon really got the form factor down perfect for the Kindle 2. For a rigid device, I don’t believe there’s a better formfactor than what Amazon managed with this thing. It feels comfortable in my hands and it’s thin and light enough that I don’t mind carrying it around. Give it a high res multitouch screen and I think this may be the ideal form factor for an Apple Tablet. The Kindle 2 solves my problem of being stuck waiting somewhere with nothing to do. A couple years back I bought a few books that I wanted to start carrying with me so I had something to do if I was waiting for a meeting, appointment, ferry, whatever. A good idea, but in practice I almost never had the books with me. The Kindle 2 lets you carry an unreasonable number of books of course, so that solves the carrying problem. You also get free wireless access, wherever you get a cellphone signal, to Amazon’s Kindle Store. The books download in a matter of seconds and the process is very simple. You can also have books wirelessly delivered (for no additional charge) to your Kindle if you purchase them on a PC. The biggest downside about the whole book carrying/acquiring aspect is Amazon’s Kindle Store is hardly complete. While the majority of books I’ve wanted to read on the Kindle were in the store, there have been a few notable exceptions. Unfortunately there’s very little recourse. You can send a note to the publisher on Amazon’s book store indicating your interest in a Kindle version, but you’re otherwise out of luck. Normally the caveat about displays would come next. About how it’s easier to look at and feel pages of a book than read something on an underpowered PC. 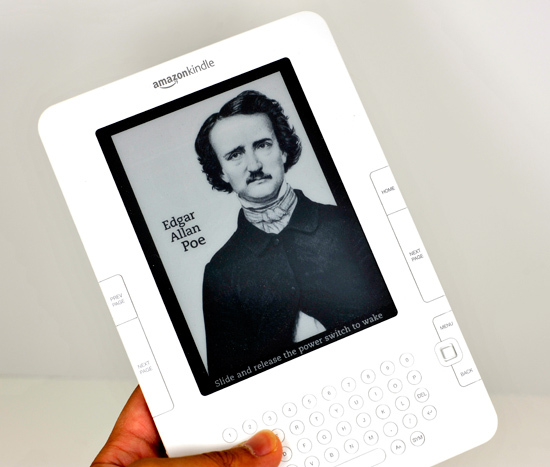 While the Kindle 2 and other ebook readers lack the flexibility of paperback, they use electrophoretic displays (EPDs) which are far easier on the eyes than an LCD. Unlike LCDs, EPDs are static until the screen contents change - there’s no refreshing. That’s great for power consumption, but not so great for moving images, in other words - perfect for a book. EPDs also have no backlight, they work by reflecting/absorbing light - just like a piece of paper. Unfortunately this means that reading a Kindle in bed at night requires a reading lamp, yep those still exist. The end result is a very book-like display, perfect for reading text although not great for high resolution images. There’s just one last problem: most SoCs don’t have integrated EPD controllers, they are used to displaying on LCDs. The Kindle 2 uses a separate EPD controller made by Epson. The external (to the system’s SoC) controller requires its own DRAM and NAND flash. The DRAM is used to store what’s currently on the EPD and what’s going to appear next, the difference of the two is needed to calculate how to charge the EPD to change the display. The NAND flash is used to store information about the specific display used in the device. There’s apparently a lot of display-specific tuning that the controller needs to be aware of, something that can very from one display to the next in manufacturing or even due to environmental conditions. The EPD controller stores data about the display it’s paired with in local NAND flash. The problem with this approach is that it unnecessarily duplicates hardware. The Kindle 2 (and all other ebook readers) already use an application processor SoC which has its own flash and DRAM. But most SoCs feature an integrated display controller for conventional video outputs, not an EPD controller. You can probably guess where I’m heading with this. 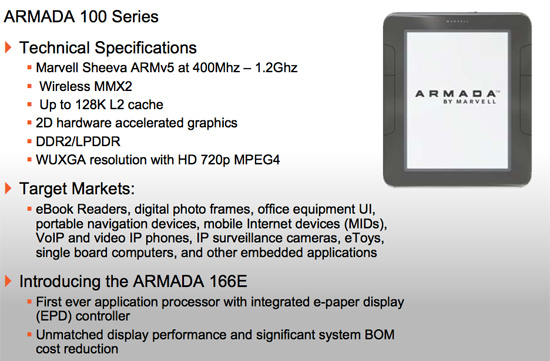 A couple of weeks ago Marvell announced its ARMADA line of ARM-based SoCs, among them was the ARMADA 166E. Based on Marvell’s PJ1 ARM CPU core, the 166E is designed for applications with low performance requirements like digital photo frames and ebook readers. The 166E is also the world’s first application processor with an integrated EPD controller. Not only does the integrated EPD controller reduce board size (you integrate one more controller), but it also reduces cost: you don’t need another package with an integrated NAND flash and you don’t need another DRAM. Marvell is also going to be offering a complete platform around the 166E. 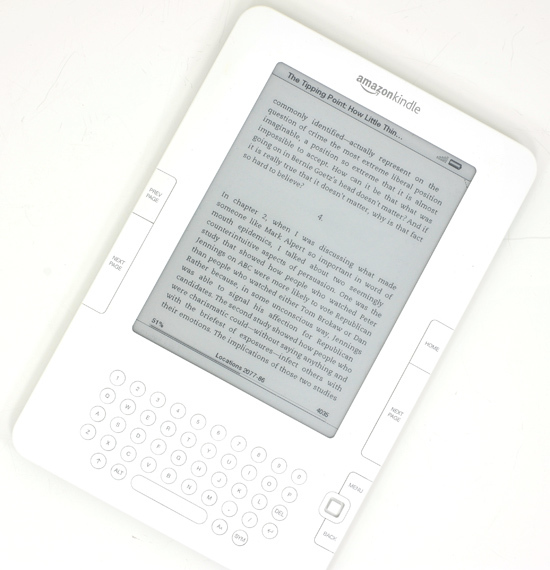 Platform, in the ebook reader sense means the 166E as well as Bluetooth, WiFi and cellular network support. 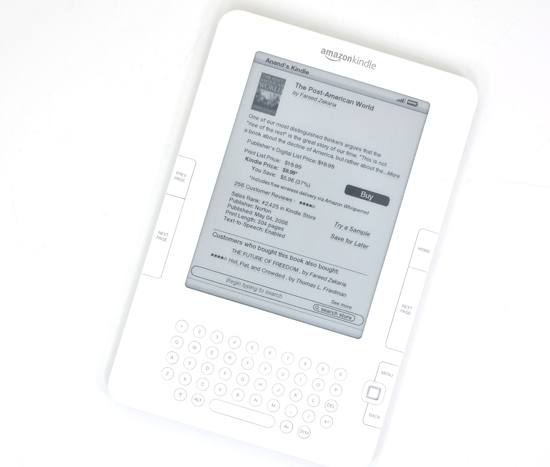 Today Marvell is announcing that it has a number of customers currently developing ebook readers based on the 166E, with the first examples due out in 2010. As companies like Marvell make putting together an ebook reader easier, you can expect hardware vendors to jump into the reader business. 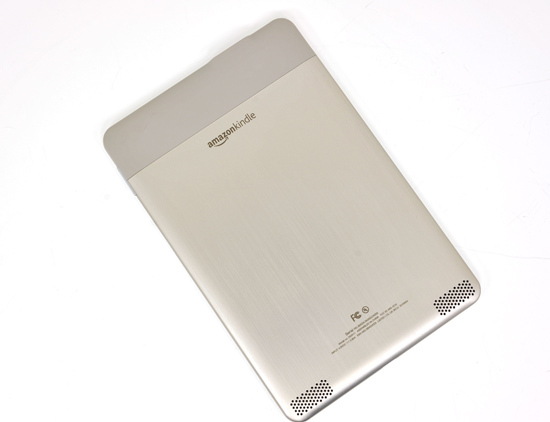 We’ve already heard rumors of ASUS building an ebook reader as a part of its Eee lineup. I’m not sure how large the market will get, or even if ultimately there’s room for a standalone ebook reader as a primary device; if it weren’t for the reliance on an EPD, I’d say that eventually the functionality would just get integrated into a tablet. There’s always the Kindle app for the iPhone. Looking back at my Kindle 2, I like it a lot. It’s definitely the iPod of the ebook world. Unfortunately for Amazon and other manufacturers getting into the ebook reader market, reading just isn’t as popular as listening to music. We probably won't see the same hype over ebook readers in 2010 that we did for MP3 players a decade ago, but it's their turn to shine. popular science reported how these new devices were on the verge of replacing paper. now 15 years later, theyre more expensive and bulkier. more screen, less nonscreen please. and when the actual ebooks cost 10 bucks anyway, why not just get the paperback? Love the Kindle, a gift from Xmas 2008. Found myself reading more frequently, trying new books more than I would have before. More authors are providing Kindle books free, giving you the chance to try them out first before buying more of their books. Worked for me, discovered some great authors this way. So then I get the iPhone over the summer. Kindle on the iPhone app is free. And, despite the smaller format, I'm now using the iPhone almost exclusively for reading. More portable, with a backlit screen. Can read anywhere anytime, while the Kindle is too large for the pocket. It is better suited for travel and long term reading sessions, as compared with the iPhone format. My wife, who gave me the Kindle, is now using it for her reading. I'm reading so many more books now than even with the Kindle. So, I love the Kindle, but I love the iPhone even more. The screen is too small. The device is too expensive. It's not good for reading ebooks in PDF format. The best ereader would have a screen big enough to display properly all these thousands of books in PDF format \and not only an incompatible, proprietary format\. Will last at least 2-3 days without recharging, will be rigid and will be affordable even for poor people. And then we actually might start saving the planet and the trees.